Losing hair can be a difficult experience for anyone. Society associates hair with youth and beauty and the realization that your hair is thinning can often be stressful and have a big effect on self-confidence. Society also tends to think of hair loss as a condition that affects men, which can make it more difficult for women to get the help they need. 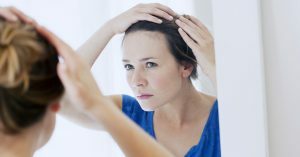 Research has shown that women can have a particularly difficult time coping with the self-esteem issues that are associated with hair loss. According to Medical News Today, women account for more than 40 percent of all hair loss sufferers and like men, women also look for a permanent solution to hair loss. At RHRLI we feel we have that solution with the ARTAS® Robotic Hair Transplant System. We’re hair loss experts and we understand the difficulties our patients encounter. So we want to give you information on how thinning hair affects a woman’s self-confidence. Rachel Rocero is a San Francisco-based marketing expert who has suffered from both alopecia areata, an autoimmune disease that causes hair loss, and androgenic alopecia, also known as female pattern hair loss. Writing on the Hello Giggles website, Rocero described how devastated she felt. Rocero’s experience isn’t unusual for women with thinning hair. According to the British Psychological Society, 40 percent of women with alopecia have had marital problems, while around 63 percent said they had career-related problems. Alopecia also leads to depression, anxiety, and social phobia, according to researchers. Another difficulty for women who are dealing with hair loss is that they’re often reluctant to talk about it. According to the International Society of Hair Restoration Surgery, women who have hair loss often believe their problem will not be taken seriously by family and friends. As a result, they have less of a support system available to them than men have. If you believe you have a high level of anxiety or depression related to hair loss, you should consult a mental health professional immediately. If you’re looking for answers about your hair loss, you should consult with RHRLI. Our doctor, Baiju Gohil, MD, meets with all of the patients that schedule consultations with us and also takes part in all of the hair restoration procedures done in our office. For those seeking a permanent solution to hair loss or thinning hair, RHRLI is the only hair loss treatment center on Long Island that features the ARTAS® system. It’s a minimally invasive procedure that uses robotic technology to give you a healthy, natural head of hair. To get started, contact RHRLI today. Please note that the author of this piece is not a doctor and the information in this material is not intended as medical advice. Please consult your doctor or medical professional for specific information regarding your individual situation.